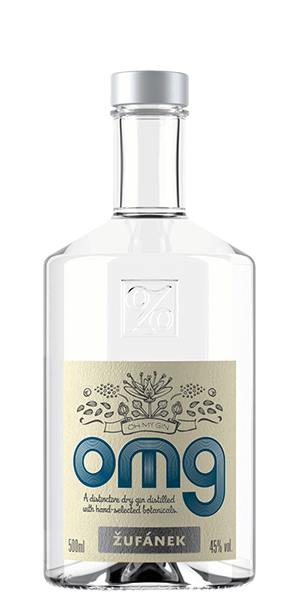 Zufánek is a family distillery in Moravia, Czech Republic. It was founded in 2000 by Marcela and Josef Zufánek and their three sons Martin, Josef, and Jan. Everything is made in relatively tiny 300-liter copper stills from locally sourced ingredients with no artificial anything — just the way we like it. They have two products and a tendency to name them after leet-speak text acronyms. OMG (Oh My Gin) and their yearly special edition OMFG. Zufánek imports nothing. Everything is grown on their own orchards or locally sourced. There are a total of sixteen botanicals, like juniper, coriander, grains of paradise, angelica root, lavender, orange zest... They even ad a little almond. The new twist is the addition of small leaves from the Slavic linden tree — the Czech national tree — which have a long history in herbal medicine and add a light, almost citrus-like sweetness. And because this is the very definition of small batch craftsmanship, each bottle is 1/2 liter in size. What does Oh My Gin taste like? The Flavor Spiral™ shows the most common flavors that you'll taste in Oh My Gin and gives you a chance to have a taste of it before actually tasting it.